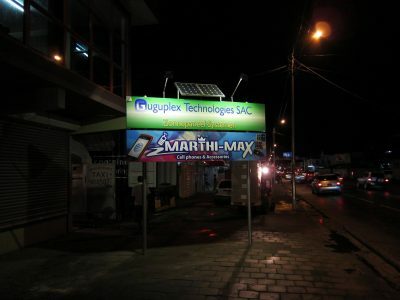 Guguplex Technologies brings you the best in low cost solar technology allowing people to enjoy light, communications and music at home and work no matter how far they may live from an electricity grid. Our mission is to make this technology affordable and available to those who need it the most so that they can enjoy the benefits so many take for granted. Our solar systems are made up of carefully chosen components, each one tested for reliability and quality and installed by trained personnel. Each system is designed to act like mains electricity with lights turned on/off by wall switches and power inverters generating AC electricity with many of our systems. Solar systems in sunny countries are very cost effective – the solar panel will keep generating electricity for 25 years after it has been installed from sunshine and the light bulbs and charge controllers will last for 10+ years. The only component that needs replacing is the battery which typically last 3-5 years depending on how heavily they are used. Replacement batteries and lights are available through Guguplex and from other suppliers and we can advise on suitability.